The U.S. Missile Defense Agency (MDA) and U.S. Navy successfully conducted an intercept of an intermediate-range ballistic missile target with a Standard Missile-3 (SM-3) Block IIA missile on December 11, according to a MDA statement. The December 11 test involved the interception of a mock ballistic missile target outside the earth’s atmosphere, air-launched by a U.S. Air Force C-17 from the broad ocean area thousands of miles southwest of the Pacific Missile Range Facility (PMRF) at Kauai, Hawaii, with a SM-3 Block IIA missile launched from an Aegis Ashore Missile Defense Test Complex at PMRF. According to the MDA, the test met its objectives and the target was successfully destroyed. The December 11 intercept marks the second successful test of a SM-3 Block IIA missile in 2018. On October 26, a SM-3 Block IIA missile launched from the Arleigh Burke-class guided missile destroyer USS John Finn (DDG-113) successfully destroyed a medium-range ballistic missile target launched from the PMRF. A previous successful test of the Aegis Baseline 9/5.1 BMD combat system with a SM-3 Block IIA missile took place in February 2017. Two other tests of the missile in June 2017 and January 2018 ended in failure. The SM-3 Block IIA is designed to destroy short- to intermediate-range ballistic missiles. The missile has been under joint development by U.S. defense contractor Raytheon and Japan’s Mitsubishi Heavy Industries since 2006. It can be deployed on Aegis-equipped guided missile destroyers or on land, via Aegis Ashore sites. The U.S. currently operates an Aegis Ashore battery, the land-based variant of the Aegis combat system for defense against ballistic and cruise missiles, in Romania. Another Aegis ashore battery is being installed in Poland and is expected to become operational by 2020. Both batteries are slated to receive the SM-3 Block IIA once it is declared operational. 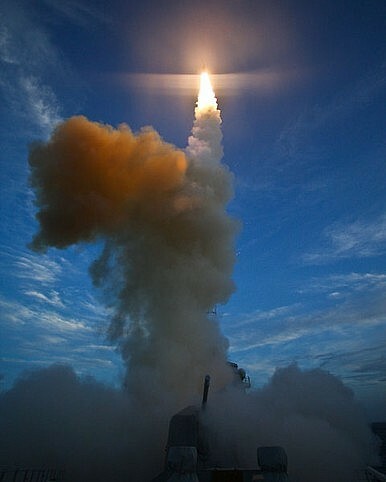 The Japanese government also plans to deploy two Aegis Ashore batteries by 2023 in Japan to supplement Patriot batteries capable of engaging short- and medium-range ballistic missiles in their terminal phase and Aegis-equipped guided-missile destroyers.